Paul Dumbrell has claimed the first race win for the Dunlop Super2 Series at the Tyrepower Tasmania SuperSprint on Friday. 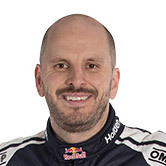 Dumbrell claimed the victory by a narrow 0.6822s margin ahead of Todd Hazelwood in a shortened race. The Eggleston Motorsport racer inherited ARMOR ALL Pole Position for the opening race after Prodrive's Garry Jacobson was excluded from qualifying. Hazelwood was pushing to add his second Super2 win, taking the lead from Dumbrell at that before losing it again on the second lap. Dumbrell then controlled the field in a race interrupted by two safety car periods. The pair had a single racing lap after the second safety car before the chequered flag was flown in the time certain finish. Rookie Super2 racer Will Brown proved his ability to fight at the front despite his relative inexperience as he scored third place just over a second behind the leader. Jack Le Brocq and Shae Davies pushed their Nissan Altimas to finish at the front of the pack, claiming p4 and p5 for Matt White Motorsport. An incident between Renee Gracie and Matt Chahda triggered the first Safety Car. The pair made contact going into the hairpin before the #98 Caltex Commodore was beached in the sandtrap with damage to the front left wheel. Gracie was towed back onto the track before returning the damaged car back to the pits while stewards will investigate the incident after the race. Adam Marjoram’s first race in Tasmania also came to an end after damage to the passenger side of his Commodore. Richard Muscat caused the second safety car after stopping in the gravel trap at Turn 2. The GRM driver had a high speed lock-up at the same corner on the previous lap but became stuck during the second incident. Adding to the incidents in the race, Andrew Jones lost a door skin near Turn 4 while Bryce Fullwood undid his early race efforts when he went too deep and hit the concrete on the exit of the hairpin, dropping him down the order. Reigning champion Jacobson started the race from the back of the grid, but fought back to 10th place. The Dunlop Super2 Series will be back on track Saturday at 1:05PM for the second race at the Tyrepower Tasmania SuperSprint.